Surprise your family in the Philippines with a Jollibee Langhap Sarap meal even when you’re abroad! Contact Forex to order your Jollibee meal today! Contact us at, 02 8777 0000, email us at, customerservice@forexworld.com.au, like and visit our facebook ge https://www.facebook.com/forexworldaustralia. What is Jollibee Padalang Langhap Sarap? Jollibee Padala is the 1st food remittance product in the country, developed by BDO Remit & Jollibee Foods Corporation. This product enables remitters overseas to order Jollibee meal packages of their choice and have these enjoyed by their beneficiaries in the Philippines through delivery, dine-in or take-out. What benefits do Overseas Filipinos get from Jollibee Padala? The remittance fees vary per BDO Remit subsidiary office & remittance partner. Please see the attached meal packages and their prices (effective April 1, 2017). Which areas in the Philippines are covered by Jollibee Padala delivery, dine-in and take-out transactions? The meal packages are available for delivery in key cities nationwide; while dine-in and take-out transactions are available at any Jollibee store nationwide. For a complete list of Jollibee Stores, visit http://www.jollibee.com.ph/stores. 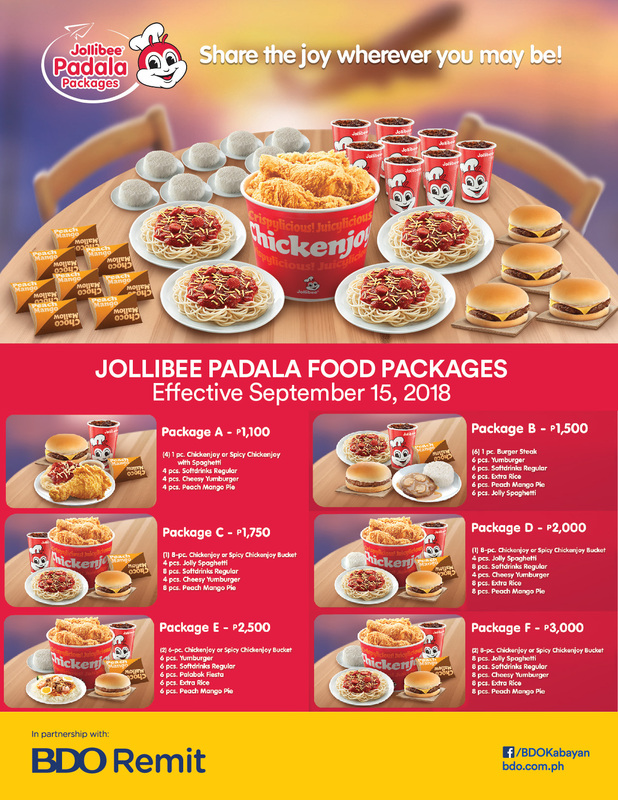 What information is required in ordering Jollibee Padala packages from abroad? What is the lead time in processing Jollibee Padala orders from abroad? The lead time for delivery, dine-in and take out orders depends on the price/cost of orders. Transactions received beyond 5:00 pm (Philippine Time) shall be processed the following calendar day. Day 1 shall start on the date the order was processed by Jollibee. Will Jollibee Call Center contact the beneficiary prior to the meal package delivery / dine-in / take-out schedule? Yes, Jollibee Call Center shall contact the beneficiary (3 attempts) prior to the delivery / dine-in / take-out schedule to verify the transaction details. If Jollibee Call Center cannot contact the beneficiary within the 3 attempts, what will happen to the transaction? Jollibee Call Center shall tag the transaction “For Verification” stating the inability to contact the beneficiary. BDO Remittance Service Inquiry team will then coordinate with the respective subsidiary office / remittance partner for the disposition of the said transaction. For Dine-in / take-out transactions, how will the beneficiary know which Jollibee store to visit? Jollibee Call Center shall provide the beneficiaries exact location and landmarks of their preferred Jollibee store. What requirements does a beneficiary need to present upon availing of dine-in and take-out transactions? Will the beneficiary need to present a valid ID to accept a meal package delivery? There’s no need for the beneficiary to present a valid ID when accepting a meal package delivery since the address was already confirmed by Jollibee Call Center prior to delivery. If the beneficiary fails to accept the delivery or avail of the dine-in / take-out transaction as confirmed & agreed during the Jollibee Call Center verification process, what will happen to the meal package order? If the verification process is successful, yet the beneficiary fails to accept the delivery or avail of the dine-in / take-out transaction, Jollibee shall consider the meal package paid and sold. In case of meal package & price changes, how will subsidiary offices and remittance partners know about this? For price changes – within forty-eight (48) hours prior to effectivity date*. For transactions processed before the effectivity date, the old or existing pricing shall still be used. Meal package/product changes – one (1) week prior to effectivity date. For transactions processed before the effectivity date, the old or existing meal package shall still be used. *If the new pricing has been cascaded abroad but the old pricing was still used, the discrepancy in the transaction amount shall be shouldered by the erring personnel. Can Jollibee accommodate special requests of beneficiary to change meal packages ordered by the remitter? Accommodation of special requests such as change in meal package shall be the discretion of Jollibee based on its existing guidelines. How will the subsidiaries & remittance partners know the status of Jollibee Padala transactions? To manage customer expectations, let the remitter know that delivery is available in key cities nationwide, while dine-in / take-out is available at all Jollibee Stores nationwide. If remitter instruction is either delivery or dine-In, beneficiary can choose between the two. For delivery transactions, beneficiary can change the time only and NOT the delivery address. For dine-in / take-out transactions, beneficiary can change the date and time within 7 days from the original date specified by the remitter. Beneficiaries of dine-in transactions are expected to avail of their Jollibee Padala package at the Jollibee store that was confirmed during the Jollibee Call Center verification process. Subsidiary office / Remittance Partner amends the transaction to include correct details or contact numbers. If amended, the minimum order lead time must still be followed.